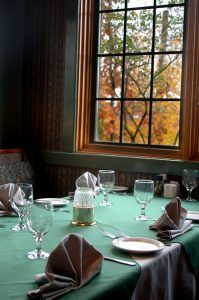 One of our favourite dining experiences, Tall Trees never disappoints. We adore the charm of the venue – a quaint century home perched on a hillside overlooking Hunter’s Bay in Huntsville. In the cooler months, as you enter the foyer, you are welcomed by the warmth of an old-fashioned radiator. The worn wooden floors and the carefully selected antiques make you feel as though you have stepped back in time. The menu is reliably delicious. Favorite classics for lunch or dinner, and “appies” and dessert to dream about. The service is always good and Chef Randy will frequently pop in to see that everyone is enjoying his creations. In the summer, the attached screened Muskoka Room is our go-to. Often, there will deer roaming just outside in the garden. 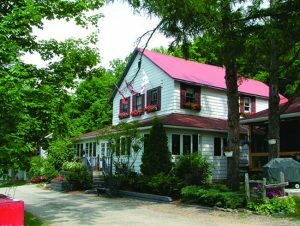 It’s a great place to enjoy a leisurely meal with family or friends in the Muskoka area.